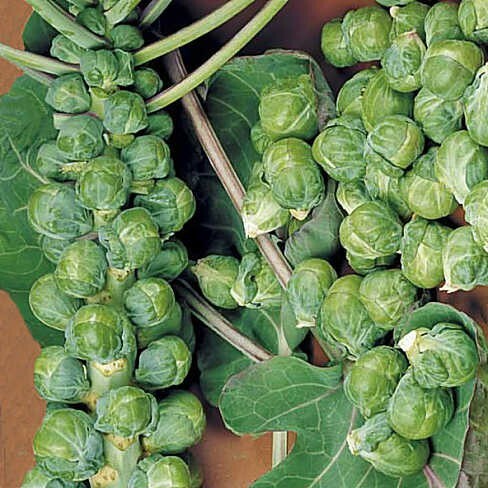 Brussel sprouts Groninger is an organically grown, very deliciously flavoured, little Brussel sprouts variety. It can be grown on heavier soils (clay). This healty and versatile vegetable can be harvested in the late autum or in the winter. It produces a large amount of beautiful, little, deliciously flavoured, tender, light green, bullet round Brussel sprouts. This variety can be harvested early. Groninger can be frozen to store. Brussel sprouts are very healthy and versatile. Brussel sprouts contain a.o. : vitamin A, B1, B2, B3, B6, B11, E and a large quantity vitamin C. And the minerals: calcium, phosphor, iron, potassium, magnesium, manganese, molybdenum and zinc. Brussel sprouts also contain the amino acid tryptophan and a lot of fibres and verry little calories. You can cook, stir-fry, bake, stew, steam and use Brussel sprouts in casseroles. You can also use Brussel sprouts in soups and mashed potato stews. Brussel sprouts combine very well with: potatoes, cheese, onions, nutmeg, curry powder, eggs, mushrooms, pasta, chicken, ginger, beef, pork, apple, mustard, minced beef and chorizo. And with various vegetables like: lettuce, tomato, carrots, sweet pepper and leek. Hardy annual. Sow indoors, for an early harvest, from February till March. Sow in trays filled with moist potting soil. Sow sparingly and cover the seeds with a thin layer of soil. Keep the soil moist during germination. Keep the temperature as even as possible and don't let the temperature drop during the night. Cover the trays with a lid to retain the moisture. Germination takes about 7 - 14 days, depending on the temperature. Remove the lid when the seedlings emerge. Transplant the seedlings to seperate pots when they're about 5 cm in size. Harden the seedlings of, from the end of April till the beginning of May. Put them in a cold frame for 10 - 14 days or put them outdoors during the day for about 10 - 14 days. Put the plants on a sunny, well manured plot with shelter against the wind and freedraining soil, from the middle of May, when there's no longer any danger of nightfrosts. Keep the plants 45 - 60 cm apart. Sow outdoors from the middle of April, when there's no longer any danger of nightfrost. Sow on a sunny, well manured plot with shelter against the wind and freedraining soil. Sow sparingly in rows and keep the rows about 60 cm apart. Cover the seeds with a thin layer of soil. Keep the soil moist during germination. Thin the seedlings to 7 - 10 cm apart when they're about 5 cm in size. Transplant the young plants to their final plot when they're about 10 - 15 cm in size. Give them a sunny plot with shelter against the wind and well manured and freedraining soil. Keep them 45 - 60 cm apart. Keep the rows 60 cm apart. Give the plants, when the Brussel sprouts are starting to grow, some fertilizer or cow dung each week. Don't sow or plant Brussel sprouts on a site were members of the cabbage family were grown in the previous year. Protect the plants against birds. Harvest the sprouts from the bottom up when they are between 2 - 3 cm in size. You can freeze Brussel sprouts. But blanche them briefly before freezing.